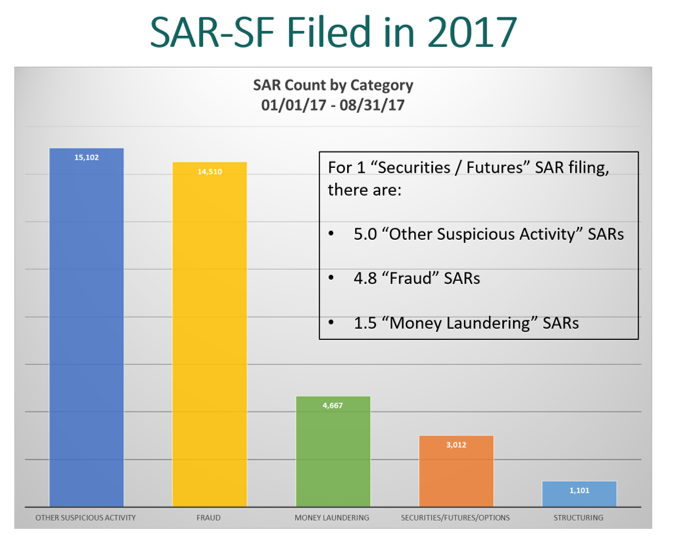 Dynamic Securities Analytics, Inc. analyzed 2017 SAR-SF filings from FinCEN’s SAR Stats to identify filing trends by securities firms regulated by the SEC. Securities firms filed 5 SARs for “Other Suspicious Activity” for every 1 SAR filed relating to securities fraud schemes. Securities firms filed 4.8 SARs for Fraud schemes for every 1 Securities Fraud SAR filing. 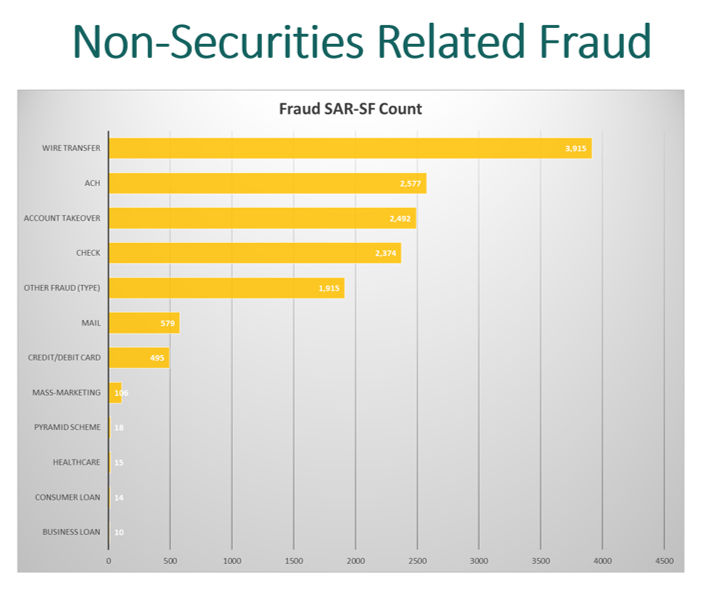 There are 12 times as many Fraud, Identification, Money Laundering, Other and Structuring SARs filed by securities firms as there are SARs filed for securities fraud schemes. Securities fraud schemes like Market Manipulation are predicate crimes that can only be executed through a securities firm whereas most of the other suspicious activity types (ex. identity theft, elder abuse, mail fraud) can occur at any financial institution type (bank, MSB, casino, etc.). This can help explain why non-securities SARs far out-number securities-related SAR filings by broker-dealers. Additionally, if a broker-dealer filed a SAR for Insider Trading, the firm may also have checked a box for the “layering” portion of the transaction when the customer moved out the proceeds of the crime. Identity Theft was the most frequently reported “Other Suspicious Activity” at securities firms and was the second most reported suspicious activity overall at securities firms. Wire fraud was the most frequently reported suspicious activity overall at securities firms. Wire fraud also lead the way over other means to move funds such as ACH, check and credit/debit card fraud at securities firm. Account Takeover comes in 3rd within Fraud schemes. 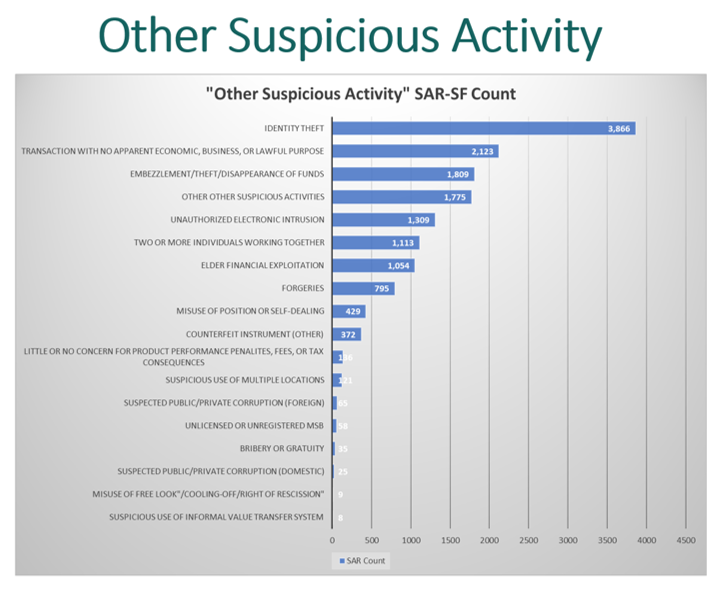 Firms can report multiple suspicious activities on each SAR. 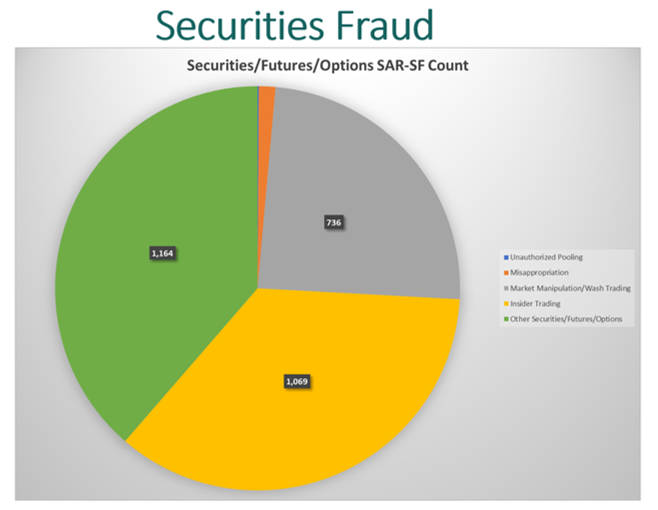 There are only five different categories suspicious activity for “Securities/Futures/Options.” Unfortunately “other” is the most commonly selected option, Insider Trading is in second place while Market Manipulation/Wash Trading is in 3rd place. There have been over 2,500 SARs filed by securities firms regarding Insider Trading since 2016 and almost 3,000 when banks and other financial institutions are included. For comparison, the SEC reported that “78 parties were charged on the basis of trading on inside information” in 2016. * Data source: FinCEN SAR Stats for Securities/Futures through August 2017 for firms regulated by the SEC. Analysis/Graphics: Dynamic Securities Analytics, Inc.